Washington, D.C. (July 15, 2016) – Iraq and Afghanistan Veterans of America (IAVA) has cleared a major hurdle in their campaign to #DefendtheGIBill stalling the top priority bill for the Senate Veterans Affairs Committee (SVAC) leadership as the Senate leaves for summer recess. Yesterday U.S. Senator Kelly Ayotte (R-N.H.) stood up for veterans in blocking the bill, heralding success for the veterans advocacy organization and its 425,000 members. For the past six months veterans have voiced their opposition to the so-called “Veterans First Act”. This legislation would have included $3.4 billion in cuts over the next five years to the the Post-9/11 GI Bill hurting military recruiting, retention and morale. Since February 2016, IAVA members have sent over 31,729 letters to Congress asking representatives to oppose any cuts to the Post-9/11 GI Bill. IAVA staff and members have held meetings with 81 senate offices and lobbied over 80 percent of the Senate on the campaign to #DefendTheGIBill. After tremendous pressure from IAVA, including testimony in March by IAVA Founder and CEO Paul Rieckhoff in front of the House and Senate Veterans’ Affairs Committees, IAVA celebrated the Senate decision to cancel plans to increase the number of years of service required in order for service members to transfer their benefit to dependents. In May, IAVA halted a House bill that included a 50 percent cut to the housing allowance provided to children who will have their parent’s Post-9/11 GI Bill benefits transferred to them. In June, during a rapid response advocacy blitz reacting to SVAC members promoting the bill on the Senate floor, IAVA members made 139 calls constituent calls to Senator Isakson and Senator Blumenthal. In July, IAVA successfully hindered the SVAC attempt to bend the rules and garner a hasty vote on the Veterans First Act ahead of their Independence Day break. 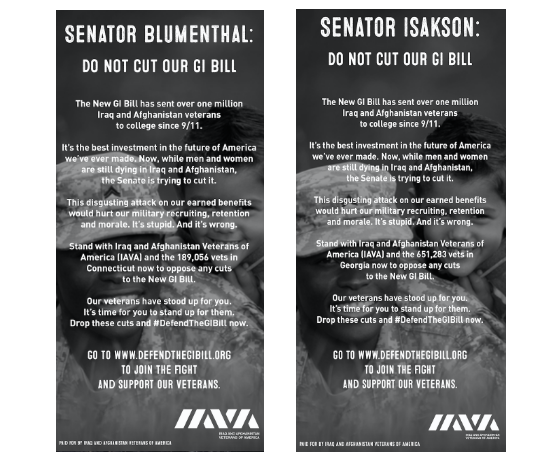 And, on Wednesday, IAVA escalated its defense of the GI Bill by launching an ad campaign in Connecticut and Georgia targeting the leaders of the Senate Veterans Affairs Committee. “IAVA fought hard nine years ago to get the Post-9/11 GI Bill passed and we will continue fighting when Congress returns from summer recess to make sure they are permanently eliminated from this bill,” concluded Rieckhoff. Secretary Hillary Clinton has pledged to oppose proposed congressional cuts to the Post-9/11 GI Bill and are calling on Mr. Donald Trump, to make the same pledge. IAVA continues to call on President Obama and members of Congress to take a stand and #DefendTheGIBill and oppose this unprecedented attempt to cut the landmark education program. The Post-9/11 GI Bill has been used by nearly one million veterans and their family members to accomplish educational goals and chart new career paths. IAVA continues to call on Congress to take a stand and pledge to #DefendTheGIBill and oppose any cuts to the benefits our veterans rely on. See a full list of Members of Congress in opposition to the cuts here.